When I think if the things I love most in this world, much of what comes to mind involves dairy and meat. When it comes to baking I rely heavily on my staples of milk, eggs, butter, and the like. My only foray into vegan baking was brief when I made some vegan red velvet cookies for a family holiday party this past December to give a legitimate sweet option for our vegan relative. They came out fairly well, with much acclaim from my family but only a shrug from me. As I have previously mentioned I’m not a huge red velvet fan to begin with, and the maple syrup used as sweetener in this recipe overpowered everything canceling out any bit of chocolate that stood a chance (which was small to begin with). I dipped my toes further into vegan waters when my pal Sophie brought me to Erin McKenna’s Bakery for some dairy and gluten-free baked goods on a rainy afternoon. As a forced connoisseur of the dairy-free food scene I trusted her positive reviews of the place and was very excited to try some baked goods that were approached from a very different way than I typically have. I prepared for the visit by trying to find out if there was any one item that Erin McKenna’s specialized in or seemed to be a particular hit. But it seemed that anything people got was a deserving of recommendation. I was simply gonna have to go in and see what called to me. I walked my way up to the lower east side bakery on a cloudy Sunday afternoon taking in the cozy atmosphere of the post-rain city. A cloudy sky and damp trees with a brisk walk is always a perfect formula for getting the body ready for an afternoon of sweet treats. Something about the cold air permeating through even the warmest of clothes directly to the skin makes a cookie or a slice of cake sound even better than on a day of fair weather. I arrived out front of Erin McKenna’s and was endeared by the cute little storefront. Their signs glowed like neon indicators of beautiful things behind that small door. I tried to get a peek through the glass to try see my options, but the way the pastry case was situated I couldn’t get a good look, so I succumbed to looking at the arts and crafts created cakes in the front window. Despite being nonedible, they were hyping me up more and more for what lay waiting inside. Sophie arrived and we went inside to scope out our options. There was not a lot of room, barely enough for a couple of people to stand in front of the case, which was mostly a problem because there was so much to decide between. There were your regular cupcakes, loaves, and brownies, and then some more unique items: cake doughnuts of multiple flavors, crumb cakes, and even vegan bagels! The most intriguing thing of all were their cupcake sandwiches. We all know that I don’t think much of the cupcakes. They are messy, impossible to get a perfectly balanced bite of, and overall a sad substitute for having a slice of cake. When I express this sentiment I often get very passionate responses supporting the sandwich method, where one unwraps the cupcake in question, tears the bottom half of cake apart from its host, and smooshes it on top of the icing to create a compact and evenly distributed method to consume it. But I always find that this just creates more crumbs from separating the cake, and if I have to personally reconstruct the item, that doesn’t make the item itself good! But to serve a cupcake sandwich as an item unto itself, now that was an interesting proposition. These were made and displayed with the purpose of being consumed as such, with a clean edge on each cake, and a nice even distribution of icing to cake. Perhaps these would, in fact, be a suitable micro-version of my beloved cake slice. Not a substitute, but a small version that pushes the same buttons. In an act of indecision I got a chocolate cupcake with pink vanilla icing in the middle, a Samoa doughnut, and their version of a thin mint cookie. We snagged a coveted space by the window and I laid out the dairy-free bounty before us. I began with the cupcake sandwich, as I couldn’t restrain my intrigue. From feel alone I could tell that the cake was moist, but taste would be the ultimate judge. My mouth concurred with my fingers’ assessment and found that the cake had a better texture than I would have expected! Not too close, not too light and fluffy, it was just the right amount of substance for the bit of cake that’s given. And in that there was some real chocolatey flavor that didn’t have a moment of weakness. This was a quality bit of basic chocolate cake that could hold its own against any quality regular milk chocolate cake. There were no extra frills or added bonuses to it, it’s not a chocolate cake that’ll be making you reconsider everything you knew about chocolate, but it’s darn good. The icing in the middle was ultra-smooth. Like, so smooth you wouldn’t beLIEVE. The textural combination of the perfectly dense cake with this perfectly dense icing was a joyful party in the mouth. The vanilla was light and soft and altogether like a combination of the classics in a whole new way! Every bite contained just the right amount of everything and was its best self to the very end. Next was the doughnut. Out of all the highly recommended items, their doughnut in its many iterations seemed to show up rather often. I went with the Samoa to cultivate a Girl Scouts theme that was completed with the thin mint and very appropriate as my parents had just dropped off some girl scout cookies to my dorm not too long ago. I also would be hard pressed to say no to the chocolate and caramel-drizzled, coconut-flaked cake after laying eyes on it. Cake doughnuts do not typically pique my interest, as I do not consider them to be doughnuts so much as individual Bundt cakes and if I want cake, well, we know what I’m leaning toward. But I have to admit that these mini-Bundt-like doughnuts were as endearing as they had been hyped to be. The smell was that luscious scent of coconut mixed with freshly baked goods, lightly wafting to the nose as I went in and took a bite. Again, the cake was perfectly moist and light, with a tinge of vanilla flavor that supported its star coconut topping. As there was just a bit of chocolate and caramel drizzled onto the top, this did not fully capture the Samoa experience, which is as much a caramel vehicle for me as it is a star vehicle for coconut. 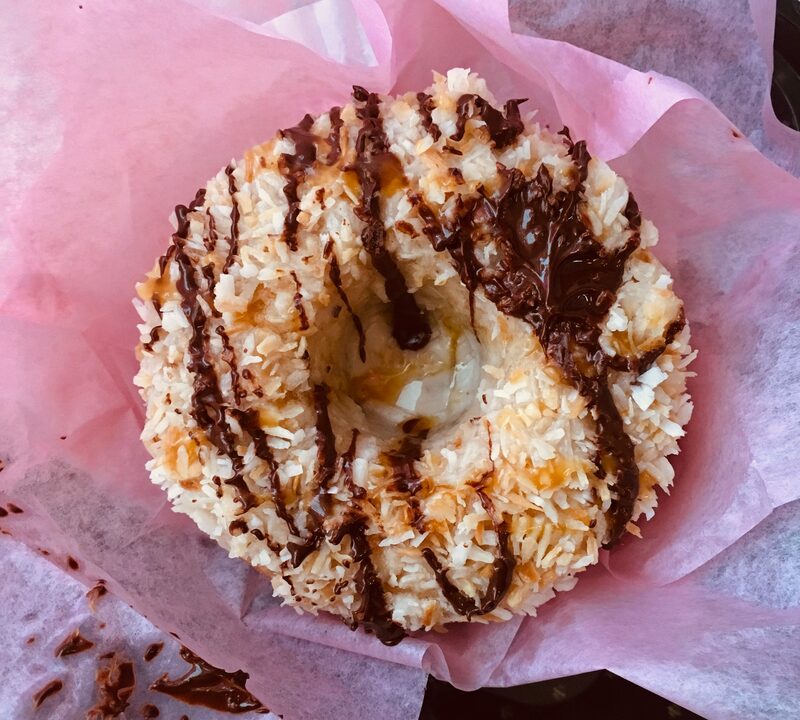 If they really wanted to capture the full Samoa flavor experience, I think the design could be similar to that of the cookie: add some chocolate that you let hardened to the bottom of the doughnut as well as drizzled on the top. Perhaps add some caramel flavor to the doughnut itself? Coat the coconut in caramel? But aside from cookie flavor accuracy, this was a damn good cake doughnut. As a new lover of coconut (a flavor I have not come to like at all until recently, and now feel as though I have been cheating myself for years) this was a quality dessert to highlight it. Lastly was the thin mint cookie. This version was much larger than the originals, certainly a “one cookie is one serving” situation. But in every other aspect this seemed the same as the signature cookie. Same thin chocolate coating, same minty/chocolaty smell. I bit off a chunk to find the texture – that recognizable crumbly crunch – was exactly the same. The chocolate to mint flavor ratio? Perfectly even. This truly was a blown up, vegan version of one of America’s favorite cookies. Mint is another flavor that I did not appreciate at all in my youth, and have only come to love in the form of thin mints recently (any other minty dessert, or savory fair for that matter, with mint in it can stay well away from me). There is something classy to the quick crunch of chocolate that is swiftly lightened up by a touch of mint. A built-in cleanser. It makes the already physically light cookie even lighter, letting you have a good time eating it but still feel great after. This large thin mint captured all of that goodness found in the Girl Scouts’ version and made it more of available if you don’t have a Girl Scout in your neighborhood or if it’s not cookie season. Even after three fulfilling baked goods from Erin McKenna’s I did not feel weighed down or gross the whole rest of the day. Perhaps it was the lack of dairy and gluten, perhaps it was their exceptional execution, perhaps it was the quality 80’s tunes they played that lifted my spirits, or perhaps it was the quality hang with a good friend, but these baked goods left not only my spirit feeling great but my body not feeling trashed to boot! 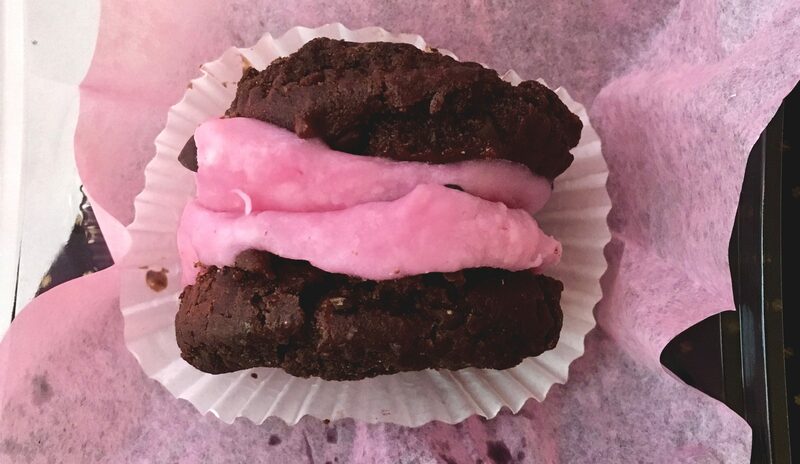 As a former lactose intolerant kid, I greatly appreciate Erin McKenna’s contribution of baked goods that could take on some of the non-vegan bakeries in Manhattan. There was plenty more in that pastry case that was calling out to me, and they convinced me with their skill in multiple baked mediums to come back and them out.